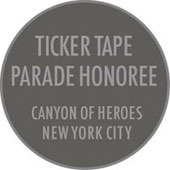 Ticker tape parades have long been held along the Canyon of Heroes, the section of Broadway from Bowling Green Park to City Hall Park in downtown Manhattan. 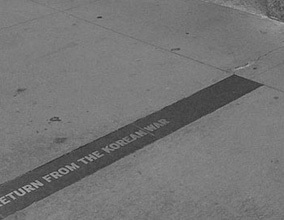 To honor the parade recipients, the Downtown Alliance of New York City has installed more than 200 black granite strips embedded in the sidewalks with inlaid text. Its a nice way to convey the historical significance to residents and visitors. 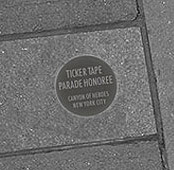 In 2003, the Downtown Alliance launched New York City's version of the Hollywood Walk of Fame to commemorate the people and events honored withticker tape parades. 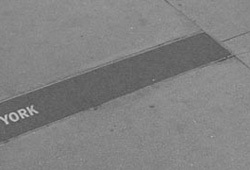 As of June, 2010, 204 granite markers have been installed in the Broadway sidewalks between Battery Place and City Hall. The first marker in the series records the dedication of the Statue of Liberty on October 28, 1886. The next ticker tape parade occurred on April 29, 1889, honoring the centennial of George Washington's inauguration in New York City as the first president of the United States. Then came a parade on September 30, 1899 for Admiral George Dewey, hero of the Battle of Manila during the Spanish-American War. Since then, honorees have included pioneers of air and space travel, numerous soldiers, sailors and sea captains, heads of state, politicians, firefighters, journalists, and athletes. The mayor of New York City gets to decide whom to honor with a ticker tape parade. The City sanitation department and the Downtown Alliance get to clean up afterward. However, the granite slabs list only a dateand a name of a person or group, and sometimes, a title or event.Most people have no clue what is being signified by the words in the granite. The date can even be confusing as it is the date of the parade, not the date of the event. I stopped several people along Broadway and pointed out the text in the sidewalk. Very few people knew why the words were in the sidewalk. The value of historic remembrance is diminished ifviewers are unaware of the context. Great design shouldn't require its intended audience to have to figure something out - great design shouldcommunicate its message clearly and effectively. I suspect when the plan was first put into effect, there were announcements and media coverage about the parade honorees. Now, however, there are thousands of visitors, residents, and workers who have no idea what these unusual lines of text signify. There is an explanatory plaque embedded at the very southern end of Broadway, where the parades begin. However, the viewer can come upon one of the plaques anywhere along the 16-block stretch of Broadway. They are more likely to see a plaque by the WTC Memorial, St. Paul's Chapel, Woolworth Building, or City Hall. In a slick presentation of the Canyon of Heroes plaques, the explanatory plaque at the beginning of the parade route could appear to be an adequate explanation. But, as so often happens in design, the solution is not critiqued or assessed through the eyes of the target viewer. If it had, the plaque approving committee would realize one explanation at the end of the 16-block route would not be enough to educate the viewer. The Alliance had a great idea and has invested money in its execution. But, it needs to go one step further to make the historical plaques better - clearly communicate what the granite slabs are commemorating. A medallion could be adhered to the granite andserve as the title block for the information on the markers. Theseshould be mounted at the end of the marker away from the street, along the buildings - this would allow the viewer to stop and read them while moving away from both vehicular and pedestrian activity. Medallions would not need to be applied to the slabs that don't have enough room for them (where the text copy takes up most of the space). The viewer will only read one or two of the stickers - they will then be educated. 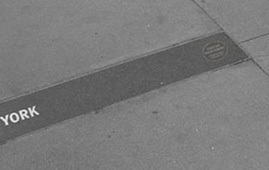 But each slab (where space permits) needs a medallion since viewers may come across the slabs anywhere along Broadway. An immediate solution is to print and apply durable vinyl decals to the granite slabs. 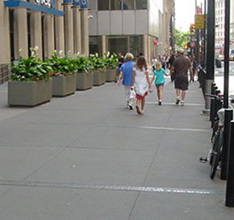 The example below is of a decal for the iPhone applied to a busy sidewalk in Times Square. A metal medallion would be a more permanent solution. The existing granite slabs could be drilled to a depth of about a half inch and metal plaques could then be adhered into that circular depression. The sticker option could be done almost immediately and the more permanent medallion could be installed in all new granite slabs andcut into the existing slabs as funding permits. The stickers and metal plaques will enhance downtown Manhattan by providing a better explanation of this unique aspect of American history. tape parades along Broadway. However, there is no indication to pedestrians what those plaques are for. Here is a simple solution: add durable vinyl stickers or metal medallions to the granite slabs. could be effective for now and future plaques could have the metal medallions embedded in them. Thank you for your email and interest on our Canyon of Heroes plaques. on our collateral. For these reasons, we are not considering altering the design of the Canyon of Hero plaques. 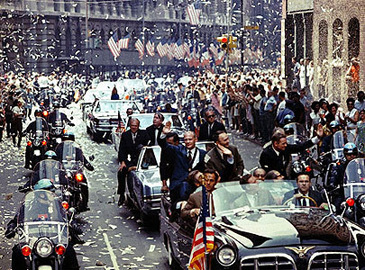 Ticker tape parades originated in New York City after a spontaneous celebration held on October 29, 1886, during the dedication of the Statue of Liberty. The term referred to the use of the paper output of ticker tape machines, which were remotely-driven devices used in brokerage firms to provide updated stock market quotes. Today, the paper products are largely waste office paper that have been cut using conventional paper shredders. 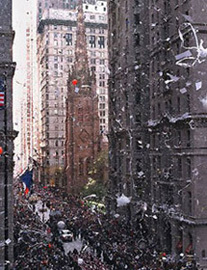 The city also distributes paper confetti. 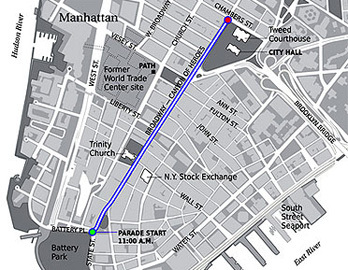 Broadway through the Financial Districtserves as the parade route and is called the Canyon of Heroes. The routefrom Bowling Green to City Hall Park is lined with tall office buildings, affording a view of the parade for thousands of office workers and the snowstorm-like jettison of shredded paper products onto the parade. The newest granite strip (at 233 Broadway in front of the Woolworth building) commemorates the New York Yankees' 27th World Series championship and was installed on June 15, 2010. Below is an image from 2013. This may be evidence of an effort to better educate the public and explain and promote the Canyon of Heroes.